Camfil GB Series Housings are designed for use in critical processes where hazardous airborne materials must be prevented from escaping to the atmosphere. 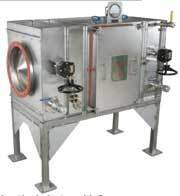 These housings are typically used in facilities that incorporate hazardous materials in their processes. Camfil FB Series Housings are designed for use in critical processes where hazardous airborne materials must be prevented from escaping to the atmosphere. Air filters may be replaced using a control barrier to protect change-out personnel contaminants captured by the filters. The FB Housing minimizes exposure to harmful contaminants during filter service through the use of a PVC bag enclosure system. The entire filter changing process isolates personnel from the hazardous materials. Camfil GN Series Housings are designed for use in critical processes where hazardous airborne materials must be prevented from escaping to the atmosphere. Air filters may be replaced using a control barrier to protect change-out personnel from contaminants within the housing or contaminants captured by the filters. These housings are typically used in facilities that incorporate hazardous materials in their processes. These contaminants may include biomedical, radiological, carcinogenic or other materials of concern. Camfil FN Series Housings are designed for use in critical processes where hazardous airborne materials must be prevented from escaping to the atmosphere. Air filters may be replaced using a control barrier to protect change-out personnel from contaminants within the housing or contaminants captured by the filters. Camfil Prefilter Housings mate directly to GB, FB, GN and FN Series containment housings. 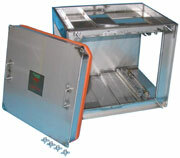 Custom designs are also available to meet any individual containment requirement. All Camfil PB Prefilter Housings are manufactured to industry standard recommended practices and evaluation criteria. Camfil FB-R Series Housings are designed for use in critical processes where hazardous airborne materials must be prevented from escaping to the atmosphere. Air filters may be replaced from the topside (unit may be mounted vertically or horizontally) of the unit using a control barrier to protect change-out personnel from contaminants within the housing or contaminants captured by the filters. The Camfil FB-R Series Housing minimizes exposure to harmful contaminants during filter service through the use of a PVC bag enclosure system. The entire filter changing process isolates personnel from the hazardous materials. Camfil's CamContain containment system is an integrated system for use in areas where hazardous contamination may be filtered from the air. The system provides for non-intrusive validation of air filters using proven scanning methods. CamContain is compact, saving valuable space in the facility. 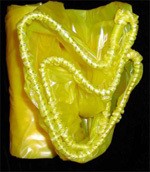 Camfil bags are available with various options, and meet stringent industry requirements. Bags are constructed of a translucent 8-mil thick poly chloride that allows service personnel to view progress as filters are changed. Each bag has an elastic shock cord hemmed into the mouth of the bag so the bag fits securely around housing opening. Every bag is identified on a label attached to the shock cord at the bag opening. Each bag includes three glove openings. This additional opening facilitates easier handling of filtration during change and provides a convenient used bag removal receptacle.